To begin with, Just Kids is an autobiography which makes it most sensible to talk about the author herself prior to dwell with the content of the book. 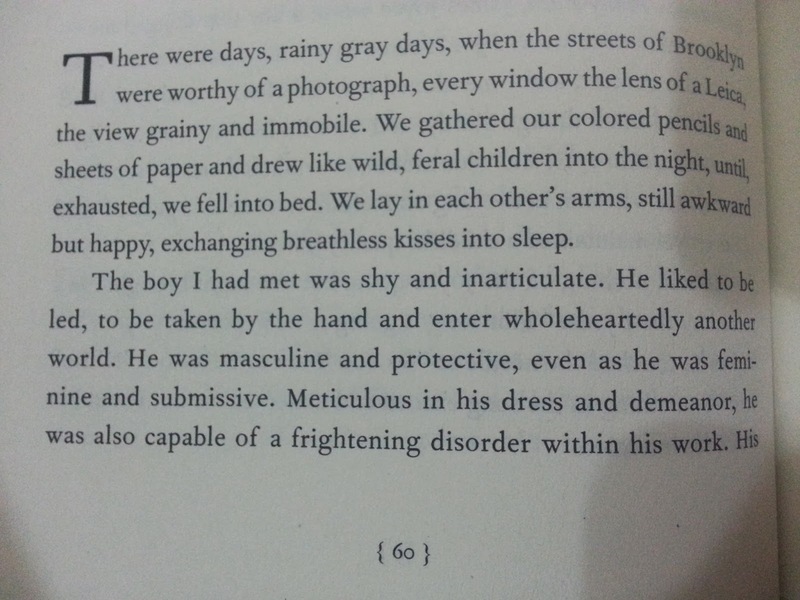 Her name is Patti Smith, a writer, performer, and visual artist as described on the back cover of the autobiography itself. I have known of her years before this book. Freja Beha Erichsen has a tattoo spelled 'float' on her neck which is taken from one of Patti's songs. So at that time, I googled her and as usual, ended up on her wikipedia page. However, wikipedia is good as to learn about stuffs, but not persons. Patti's page is written so clinically that you cant grasp a feeling, and my interest soon disappeared. And months later, i came across a very beautiful photograph of flowers in black and white. I looked at the photographer name, Robert Mapplethorpe and realized that i must have seen this name somewhere. A surname like that, even not remembered, would certainly not be forgotten. 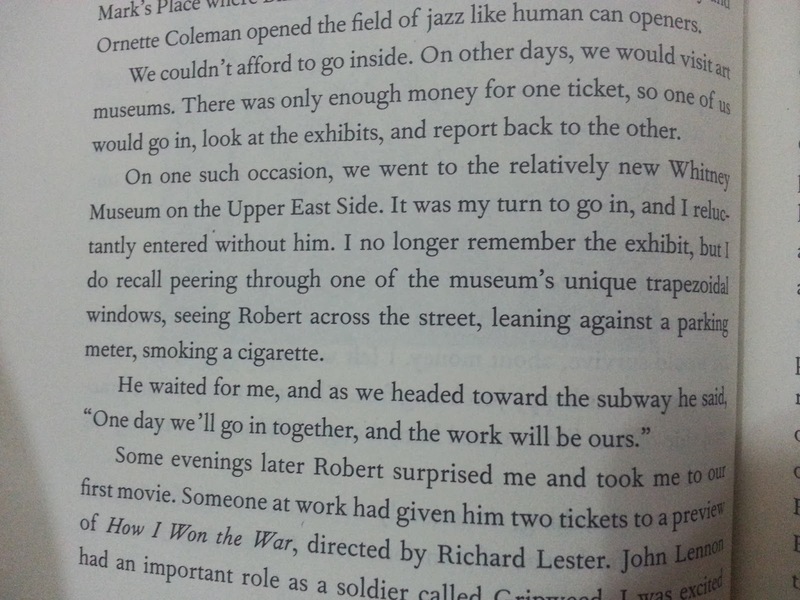 To make the long story short, i later found out that Robert was Patti's companion for a period of time and their friendship lasted until Robert's death. 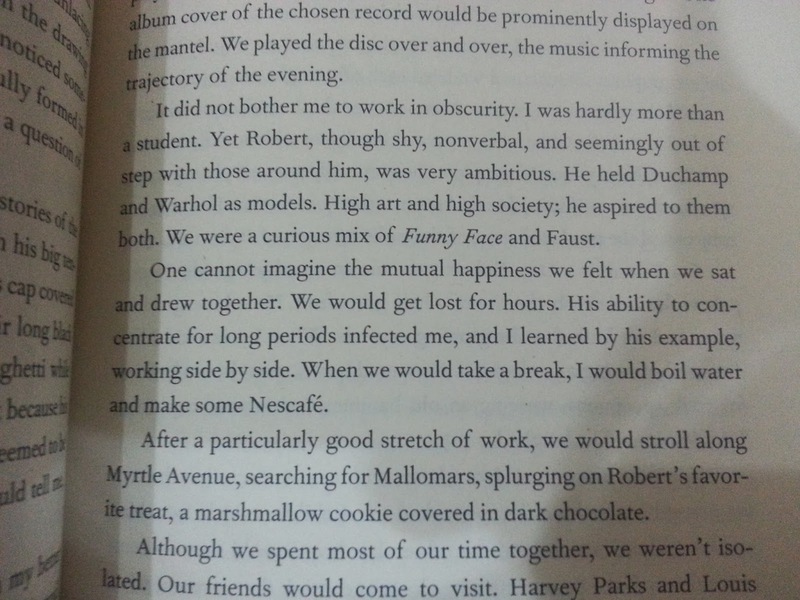 The book, in essence is Patti's personal account of her relationship with Robert. The two first met in the summer of late 1960s in a bookstore, both broke, homeless and aspiring to be an artist. Later on, they would move in together and share pay rent and love, create arts and memories. 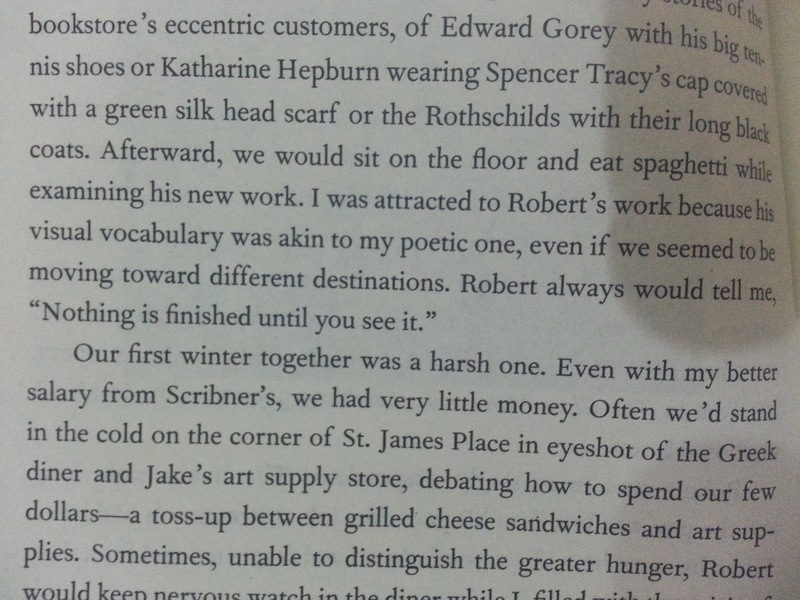 Robert, on his deathbed, asked Patti to write about their story. Robert always would tell me "Nothing is finished until you see it"
"One day we'll go in together, and the work will be ours." Having only read the book up to page 164, i think that i have been influenced a lot. It feed the dreamy side of me, the side that desires to be a singer, writer, musician, photographer and in short, an artist. Patti and Robert did not fear a thing, they stayed true to their pursuit and never once gave up though on some occasions hesitated.